Episode 2: "The Secret of the Sea"
The ship's steward from the Honolulu Star is gunned down as he is about to reveal information to an insurance company about something that was to occur aboard his ship. 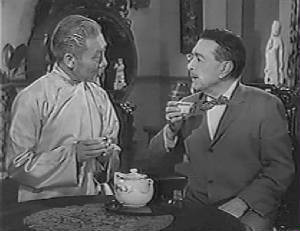 Charlie Chan is called by a well-to-do Chinese merchant, Mr. Kim, to learn who killed the young man who turns out to be Kim's son. To conduct his investigation, Chan signs aboard the freighter, bound for Honolulu, as the Honolulu Star's only passenger. At dinner with Captain Carnovan and Mr. Flynn, Chan notes the tension aboard ship as Carnavan scolds the new steward. Doris Carnavan, thirty years her husband's junior, joins the group, with Flynn quickly leaving claiming he has business to attend to. Suddenly, the ship's engines come to a stop due to a mysterious malfunction 200 miles off the California coast. In the engine room, Captain Carnavan and Chan discover that the ship has been sabotaged. Back on deck, the crew has found Mr. Flynn dead of an apparent accident, though Chan suggests otherwise, noting the death of the ship's steward earlier. Meanwhile, another ship has responded to a radio call for assistance to tow the stricken Honolulu Star back to San Pedro. Captain Carnavan mentions that the name of the captain of the rescue ship is Arturo Ramirez. Back in Los Angeles, Chan visits Mr. Kim who tells the detective that he will make inquiries to see if he has any connections to any of the crew of the Honolulu Star. Interviewed by the police, Ed Barker, the radio operator of the Honolulu Star, tells how he had radioed a general distress message to all ships in the area while receiving a response from Arturo Ramirez' ship offering assistance to the disabled ship. To tow the ship to port, Ramirez charged $150,000 fee which the insurance company claims to be exorbitant. Through Mr. Kim, Chan soon finds that Doris Carnavan had past connections with Arturo Ramirez. Doris announces that her husband has gone to kill Ramirez at the latter’s apartment. Just in time, Chan reaches the scene to stop Carnavan from carrying out his threat. Chan explains that Ramirez certainly had a confederate aboard the Honolulu Star to help with the fraud scheme, and that Mrs. Carnavan was innocent of any collusion. Alone in Ramirez' apartment, Chan notes to Ramirez that there was probably no actual distress signal sent out from the Honolulu Star. He also notes that Ramirez' ship was probably the only one contacted to tow the other ship back to port, thus allowing them to claim the large towing fee in the process. Pulling a gun on Chan, Ramirez admits that Ed Barker, the radio operator of the Honolulu Star killed both the ship's steward and Mr. Flynn. Fast work by Chan to disarm Ramirez and the timely arrival of Lt. Kovacs results in the arrest of Ramirez. NOTES: The Secret of the Sea features the appearance of two veterans of the Charlie Chan film series. Victor Sen Yung, who played Chan's Number Two Son, Jimmy, in many films, appears very briefly, and Philip Ahn, who was seen in two Chan movies, Charlie Chan in Honolulu and The Chinese Ring, performs in a featured role. As Mr. Barnum once said, "When buying calf for sideshow, two heads better than one." Very sedate - like nuclear explosion. Many marriages are not necessarily made in heaven. Obvious answer not necessarily solution to crime. Detection, and the making of good coffee, sometime require the same ingredient: the proper amount of heat to bring about the desired result. Love is like a blacksmith's hammer - it can shape the white-hot steel of emotion for both good and evil.